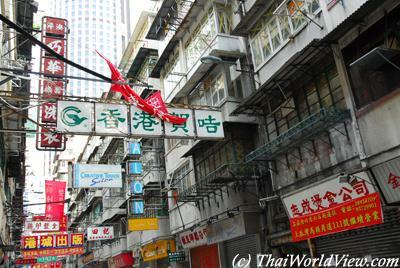 Today, Wan Chai is a very busy commercial district. New high-rise commercial buildings are built on the northern shoreline where the sea was reclaimed. 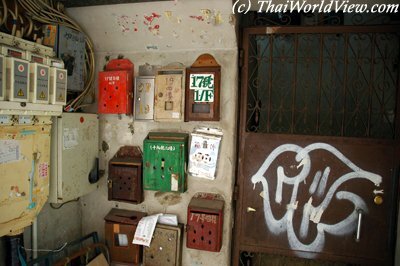 Lee Tung Street is well known locally as the Wedding Card Street as many couple printed here their cards. It was home to many shops printing and selling wedding cards. 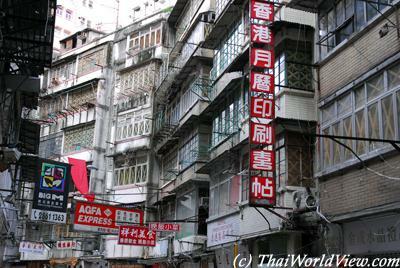 Lee Tung Street, better known as Wedding Card Street, is where Hong Kong's publishing business began. For 30 years, Wan Chai's Lee Tung Street was the mecca for Hong Kong's young couples who rushed there to order their wedding-invitation cards. Authorities announced redevelopment plans in year 2003. Local people decided to preserve the street shortly after. 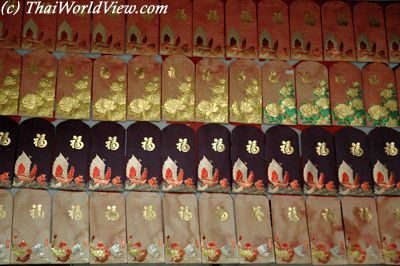 Over the past 30 years, tens of thousands of couples have visited the shops to order their wedding cards, namecards and traditional Chinese calendars. The government claimed the redevelopment would help rejuvenate the old district concerned and improve the living conditions of the residents. 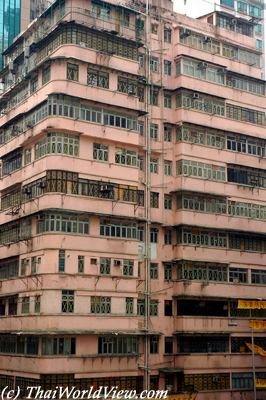 In a bid to conserve the historical uniqueness of Lee Tung Street, some residents formed the H15 Concern Group. They submitted a people-oriented redevelopment plan to the Town Planning Board, but this was rejected. 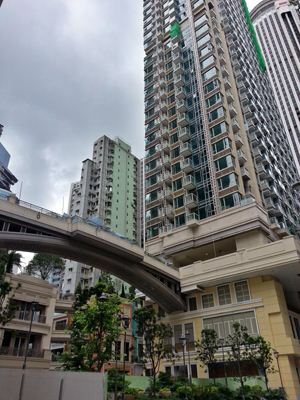 647 properties in the area are affected by the redevelopment of Lee Tung Street. 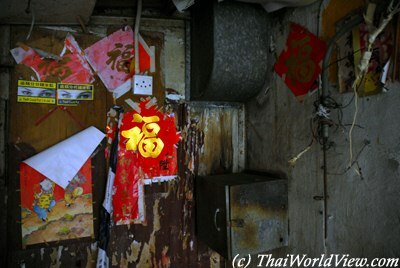 The once busy and prosperous Lee Tung Street in Wan Chai crammed with small, bustling shops is now a deserted alley. Old flats always have small incense burners outside. 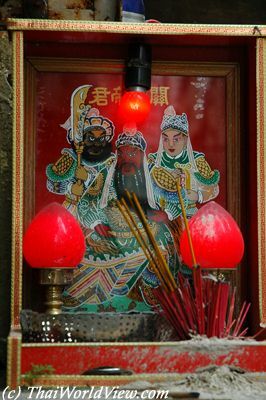 Local people lit incense sticks twice a day at morning and evening time. 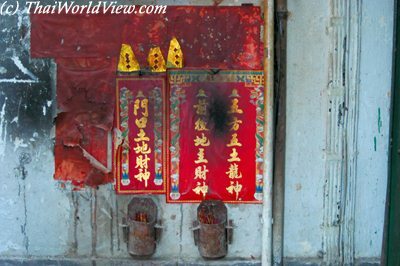 One-woman brothels were distinguishable by the unique placement outside of two incense burners, one above the other. 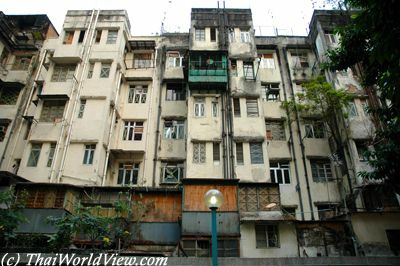 Those flats have been cleared out and are ready for demolition. 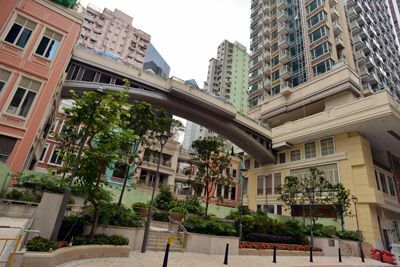 In year 2004 the Urban Renewal Authority planned to demolish the existing buildings to make way for a 3.6 billions HKD project to change the area into a leisure, shopping, residential and commercial place. 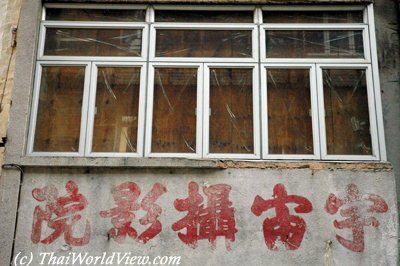 Empty buildings are closed and adhesive tape is stuck on windows. Many residents protested against the redevelopment plan but to no avail. 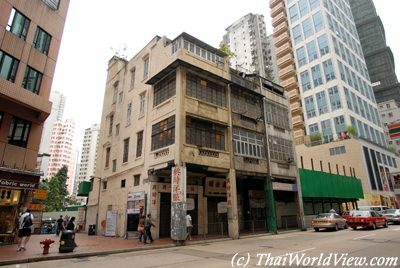 The Lands Department gazetted the resumption order for land in Lee Tung Street in year 2005, allowing it to take over properties from owners who refused to sell to the Urban Renewal Authority. When the government issued the initial order, the authority owned 80 per cent of property rights, but at the time of the resumption order it had 92 per cent in its hands. 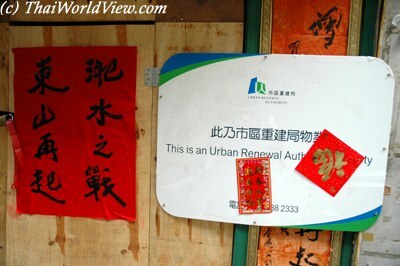 Shops are closed and now a billboard displays "This is an Urban Renewal Authority property". 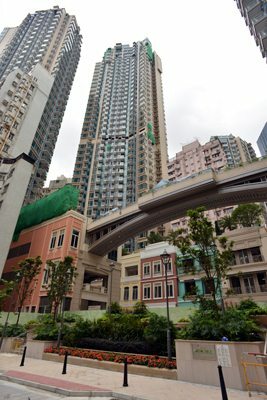 More than 90 per cent of the 647 owners in Lee Tung Street had accepted the government's compensation package and had vacated their properties. The authority has continued negotiating with the 12 flat owners and 8 shop owners who were refusing to leave. But following the resumption order for land, the remaining residents had three months to pack up and leave their buildings. Nowadays more people pay attention to the redevelopment of old streets and understand how it destroyed the existing living style that allows small businesses to prosper and low income people to live, shop and run their business in the city centre. 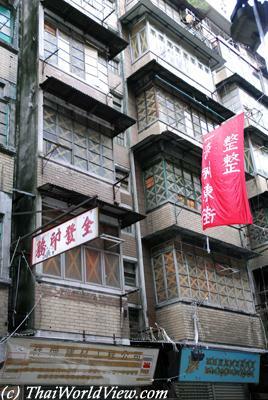 The redevelopment Lee Tung Street or Wedding Card Street has drawn vociferous opposition and is recent example of controversy involving intangible heritage. 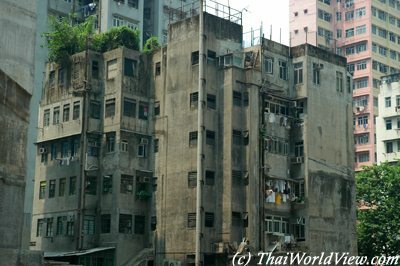 Finally the redevelopment plan affected 54 buildings, 930 people and 647 property rights. 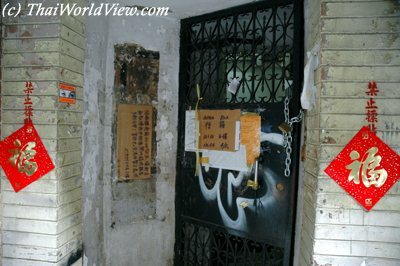 All the shops are closed down and sealed with labels from the Urban Renewal Authority, waiting to be redeveloped. One reason the Government cited for demolition of the area is that the restoration fee will be too high. What about the social cost of demolishment and redevelopment? Local people complain the authority has not evaluated how the project has shattered community relations and the local economy, why the government pulled down historical buildings of architectural value whenever redevelopment took place. 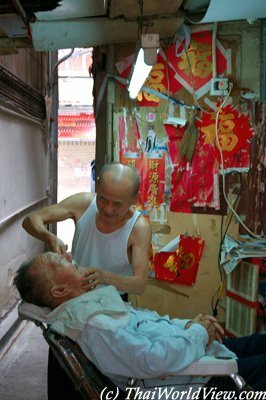 Old shops such as this outdoor barber shop, which are mostly small businesses and family run, have to move to somewhere else to make business, facing high rent and losing old customers. About 70 percent of the evicted shopowners have complained about facing drastic rent increases since leaving Lee Tung Street. 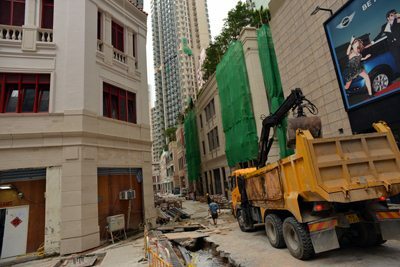 The campaign to save Lee Tung Street had highlighted the problems of redevelopment and its impact on the social network and character of old areas of Hong Kong. 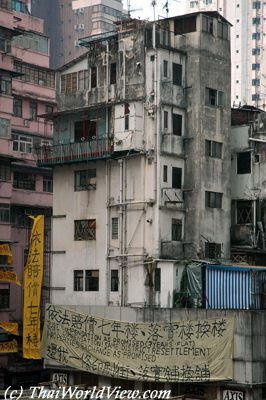 Banners brandished all over Lee Tung Street against the demolishing actions of the government. Local people denounced the Urban Renewal Authority for destroying their livelihoods, claiming that the compensation offered is totally insufficient for them to restart their businesses due to the high rents demanded elsewhere. People could not see it improving the livelihoods of small shop owners and other affected tenants. Rather, it will only allow big property developers to reap huge profits. The redevelopment has disrupted the business network in the area and destroyed the local economy. This project affected a site area about 8900 square metres including 54 buildings, 930 households and 647 property interests. The new development Content will include residential area, retails area, residential care home for the elderly, day care centre, refuse collection point, public open space and public toilet. 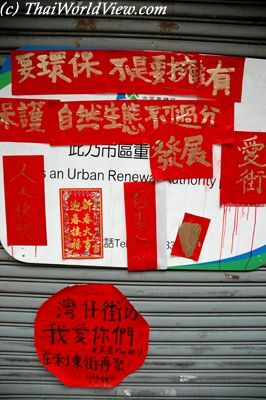 In February 2007 former residents of Wedding Card Street fly kites and stuck leaflets carrying slogans critical of the Urban Renewal Authority. Protesters decked Wedding Card Street with ribbons. 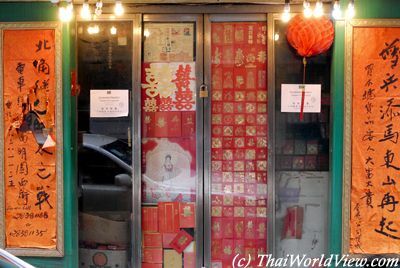 Dozens of shopowners flew kites and scribbled their wishes on red paper urging the government to reserve the ground-floor premises for shops and maintain its cultural flavor. 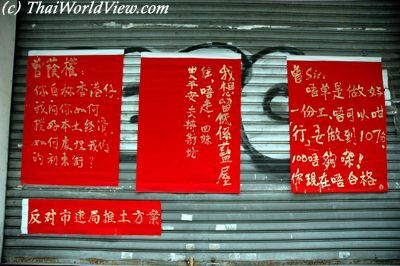 Evicted tenants wrote their wishes on pieces of red paper and on kites, in the belief their hopes would come true by releasing them into the air on the first day of spring 2007. Residents and shop owners formed a concern group called H15. It filed an alternative plan to the Town Planning Board to demonstrate it was possible to preserve the old buildings, allowing residents to continue to live there without harming the street's redevelopment value. However, the board rejected the plan. 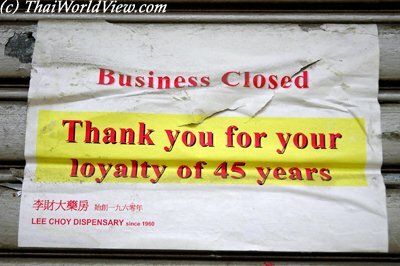 Lee Choy dispensary after serving its customers during 45 years has to close following Lee Tung Street redevelopment. The H15 group organised weekly meetings to discuss the issue and held 60 conferences and 12 residents'workshops with up to 300 people attending. They also built their own Web site to publicize their discussions about the renewal plan. A 3 years effort by residents, shop owners, architects, town planners, social workers and cultural critics failed to save the street from destruction as part of an Urban Renewal Authority redevelopment project. 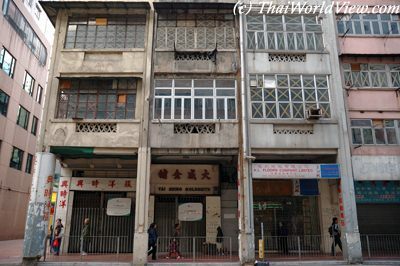 In May 2007 the Urban Renewal Authority gave green light for demolition of Wedding Card Street, home since the 1970s to more than 20 shops making wedding cards, and the surrounding area to sell the site to developers. Three high-rise residential towers with four-storey podiums reserved for shops shall be built. Three pre-war buildings with Grade II historic status shall be preserved. 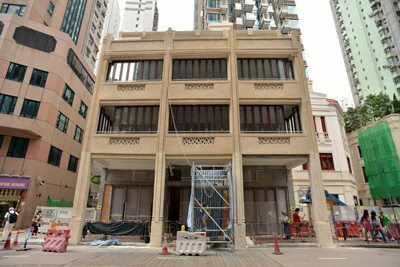 The three tenement houses (1930s) will be preserved as part of the Lee Tung Street / McGregor Street Project. 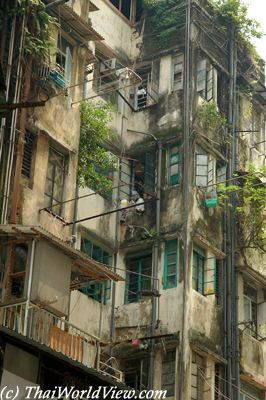 The pre-war residential blocks are unique Chinese-styled tenement houses, "Tong Lau", that were occupied exclusively by Chinese and predominantly seen in Southern Chinese cities and towns in the 19th century. 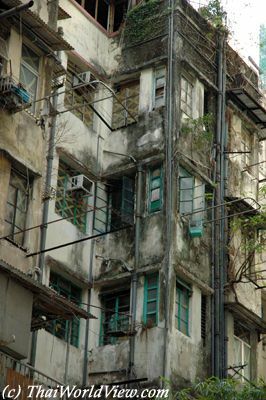 The three bays of balcony type tenement buildings form a continuous facade verandah facing Queen's Road East. 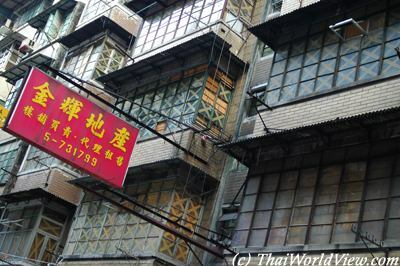 The buildings lie on land reclaimed before 1887. The buildings were identified by Antiquities and Monuments Office as Grade II Historical Buildings. 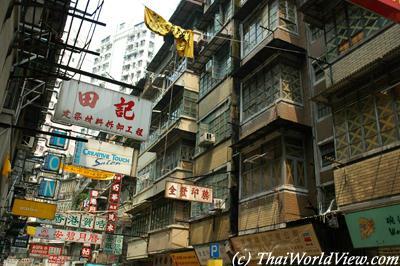 The shophouses were a mixture of Chinese and Western architectural features. They were built in contiguous blocks in elongated layout and characterised by their narrow frontage. The shophouses have 4 storeys with verandahs facing Queen's Road East. Every unit is about 450 to 700 square feet with high ceiling and French windows to the balconies. Light wells are located between the living space and the kitchen at the back. The shophouses did not have toilet provisions. The latrine content was collected by government scavengers at night. Ground floor was devoted to family business whereas upper levels were for residential purpose. Covered pedestrian arcade formed by the projected balconies and the columns on ground floor provides a sheltered area. 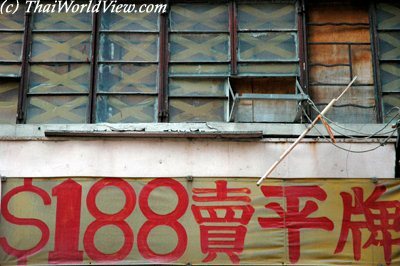 In year 2008 all the buildings located on Lee Tung Street have been torn down. Despite much protest, the teardown went as planned. During many years it was just a big block of green construction site. 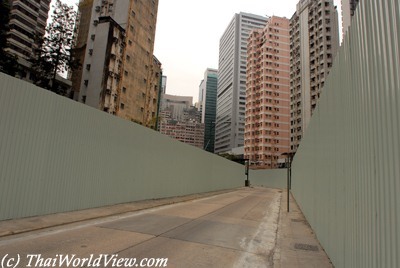 Lee Tung Street is no more. The place has been redevelopped and renamed as "Avenue Walk" in year 2013. In year 2015, "Avenue Walk" was finally renamed as "Lee Tung Avenue" so having a relation with the former Lee Tung Street. 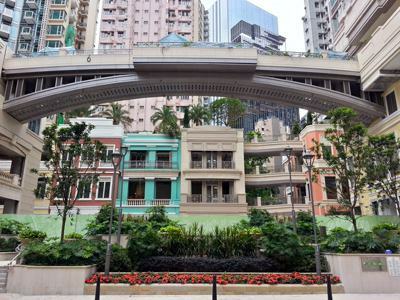 "Lee Tung Avenue" features residential and commercial sectors. It was officially opened end of year 2015. 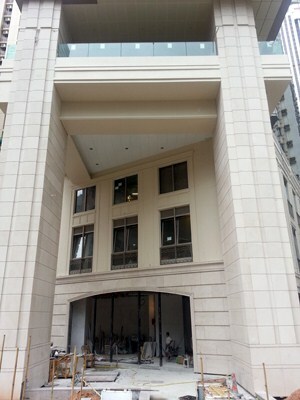 "Lee Tung Avenue" features three towers and a Central Piazza. There are also some three-storey buildings featuring 70 shops and modelled on the historic tenements at 186-190 Queen's road East. The area is now traffic-free. 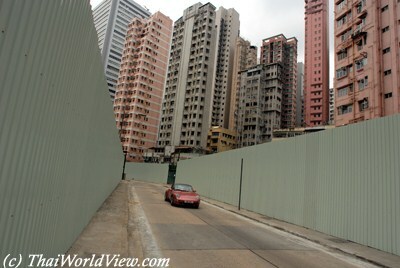 As expected rents in Wanchai - The Avenue are expensive. 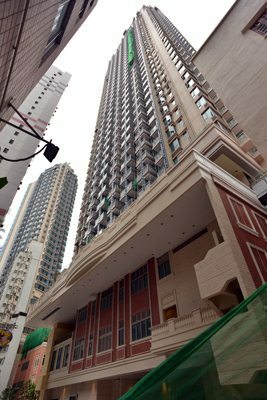 The towers feature open kitchen, clubhouse facilities, balcony and are two minutes to Wanchai MTR station. The 70 shops cover 100 000 square feet in the several three-story buildings. 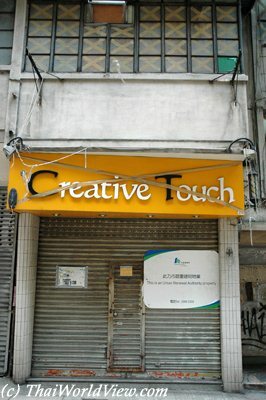 At earlier stage, developers mention that half of the shops would be wedding-related firms. Finally, as usual in Hong Kong malls, most of the shops are restaurants and boutique brand shops focusing on fashion, leisure and cosmetics businesses. As promised, some old tenants could come back but they could only afford a smaller shop as rent costs have soared. 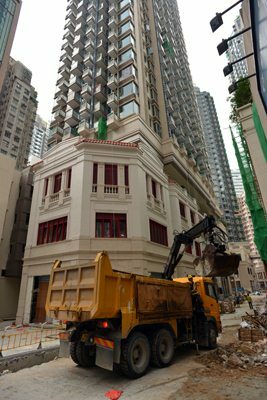 Avenue Walk is a joint venture retail project between Sino Land Company Limited, Hopewell Holdings Limited and Urban Renewal Authority in the heart of Wanchai. 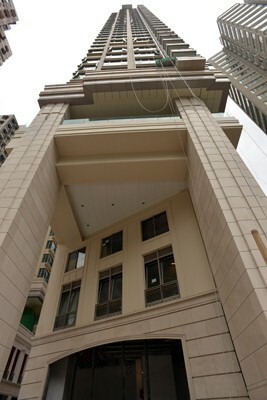 They do position Avenue Walk as Hong Kong's premier shopping street destination in Hong Kong.